You all must know about 3.5mm audio jack, here we will discuss about 3.5mm earphone jack of Mobile Phones and you may notice all the 3.5mm headset or earphone or hands-free will not work properly in some phone, that means when you use Nokia headphone in the Samsung or iPhone device it will not give you the perfect sound or only in one side ear you can hear sound and the Microphone of the earphone will not work properly, you may ask why? This question is right because the handsfree jack size is same 3.5mm and it also has 4 pole. 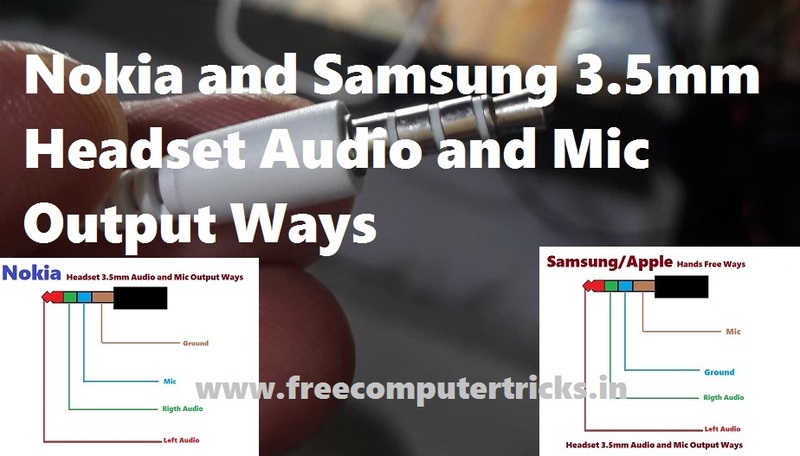 Here we will show you the difference between Nokia 3.5mm headset jack and Samsung 3.5mm jack and output connection ways and you will know what is the different between Nokia and Samsung earphone Jack. Before we start you may eager to know why we said Nokia and Samsung/iPhone earphone jack, simplifying the words, actually this is an example so that you can understand it easily. As you know before Nokia has the 2.5mm earphone to be used in it's phones and later they use the 3.5mm earphone jack with a fix output way for audio and microphone and so on some other Mobile handset manufacture use the same handsfree jack but on the other side iPhone and Samsung has the same handsfree jack size with different output connections. Now a days both the handsfree jack is being used but it may be Nokia Type or iPhone Type jack. So what we understand, that their are two types of 3.5mm headphone jack is used in your feature phone or Android smartphones one is Nokia and other one is Apple or Samsung type connector. Nokia earphone is compatible with certain phones such as in some Micromax phones, Lava phones, Xolo phones, Intex phones, Spice phones etc but it will not work on Samsung, Apple, Xiaomi Mi phones etc. and Apple or Samsung earphones are also compatible with some other Android smartphones and feature phones such as Intex Android phones, Micromax Android phones and others, you can know the earphone type by testing the both handsfree earphones. As we said before Nokia 3.5mm earphone has 4 pole and you can check the below image to know the 4 pole wiring of the head phone jack such as Left Audio Out, Right Audio Out and Mic In points, please see the below image to know Nokia headset 3.5mm audio and Mic ways and Ground pin. 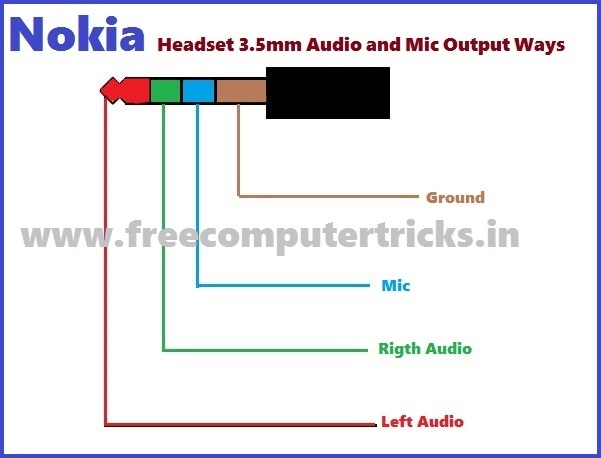 As you notice the Ground or common pin and Microphone connection is the different from the Nokia earphone connector, so for better understand please see the below image. 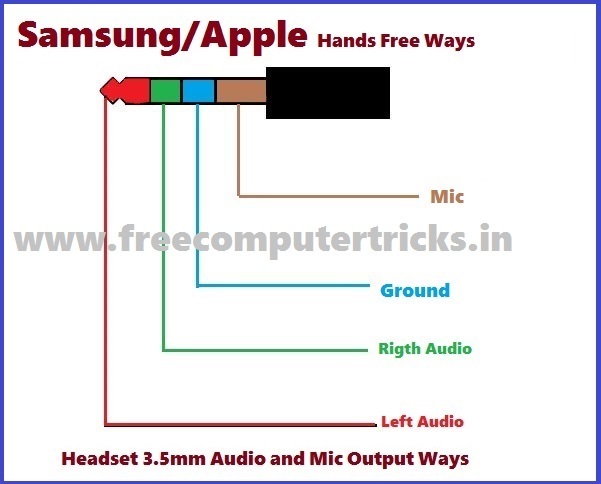 This topic is very use full if you are a Mobile Technician to know and check the Handsfree connection ways so that it's easy to find out the hands free jack problem of the phone and it you are a Mobile user you can understand the different between the two different types of 3.5 mm audio or earphone jack when you going to bye a earphone for your smartphone or feature phone.